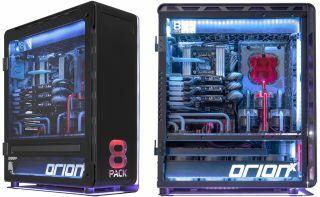 Overclockers UK is finally ready to start selling its 8Pack OrionX, a bodacious system that is quite possibly the most powerful consumer-focused pre-built on the planet. It's probably the most expensive too, with a £24,000 price tag. Just think, some lucky fellow is going to buy one. Whoever does end up purchasing an 8Pack OrionX will really be getting two individual PCs housed inside a single chassis. A Super Flower Leadex 8Pack Edition 2,000W power supply located in the base of the tower allows the two configurations to be accessible and usable at the same time. Let's start with the core hardware. The primary system is an X99 setup that pairs an Intel Core i7-6950X overclocked to at least 4.4GHz with an Asus Rampage V ED 10 motherboard and 64GB of DDR4-2666 Corsair Dominator Platinum RAM. For graphics and gaming, it also has three Nvidia Titan X (Pascal) graphics cards in a tri-SLI configuration (a quad option is available), and these are overclocked as well (2,000MHz or higher). Nvidia's been kind of moving away from multiple card setups, but if it's excess you're after, here it is. On the storage front, Overclockers UK slapped a 1.2TB Intel 730 PCIe NVMe SSD inside for primary storage, two 1TB Samsung 850 Pro SSDs in RAID 0 for secondary storage, and a 10TB Seagate Barracuda HDD because, well, can you ever have enough storage space? The second system is a Z270 setup with an Intel Core i7-7700K processor overclocked to 5.1GHz or higher, Asus ROG Strix Z270I Gaming motherboard, 16GB of DDR4-3200MHz Corsair Dominator Platinum RAM, a single Titan X graphics card, two 512GB Samsung 960 Polaris NVMe M.2 SSDs in RAID 0, and a 10TB HDD. That is an insane amount of hardware, which presents the challenge of keeping everything cool. Overclocker UK's solution was to run with three—yes, THREE—fully custom watercooling loops. "Despite the amount of water cooling, the loops have been designed in such a way that each component is kept at the lowest possible temperatures. This is all thanks to the expertly designed passthrough plates which are fitted along the rear, front, and mid-plate panels of the chassis," Overclockers UK says. If you have the required coin and desire to own the baddest system on the block, you can go here to place your order. And hey, if you're lucky enough to be on the fence, shipping is free.